Iron Man has revived Robert Downey Jr.’s career, and in return the actor is using his alter ego to promote great causes. Last month he partnered with Omaze to help terminally ill children, and recently he made a disabled kid’s day. 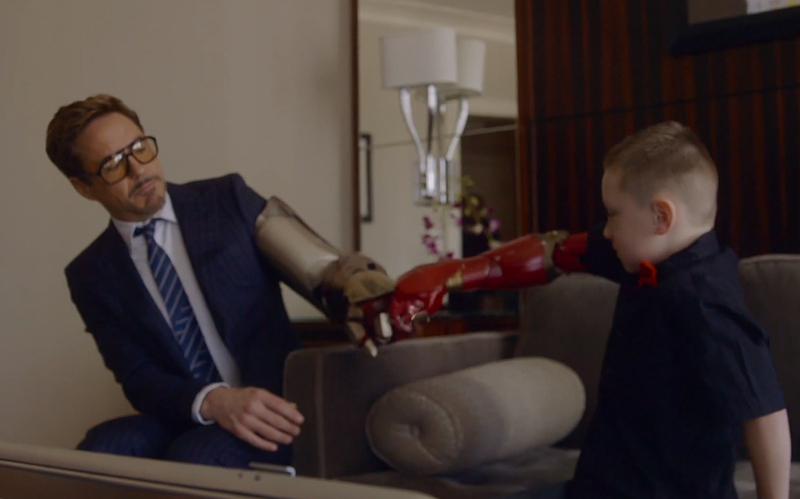 With the help of Microsoft, RDJ assumed Tony Stark’s persona to deliver 7-year old Alex Pring’s Iron Man-themed robotic arm. Tony Stark even showed off his armored suit’s arm to Alex. Meeting Iron Man is certainly a once-in-a-lifetime experience, but the real heroes here are the folks at Limbitless Solutions. Founded by Albert Manero and other former University of Central Florida students, Limbitless Solutions not only developed and built Alex’s arm, they gave it to Alex for free. The 3D printed arm has a sensor that allows Alex to open and close its hand simply by flexing his right bicep. While the robotic arm isn’t as good as a real one, Alex’s mother Alyson says her son has grown more confident and “doesn’t feel different anymore” since receiving it. He’s also become more sensitive to kids that have the same disability that he has. You can donate to Limbitless Solutions to help them help more children in need.